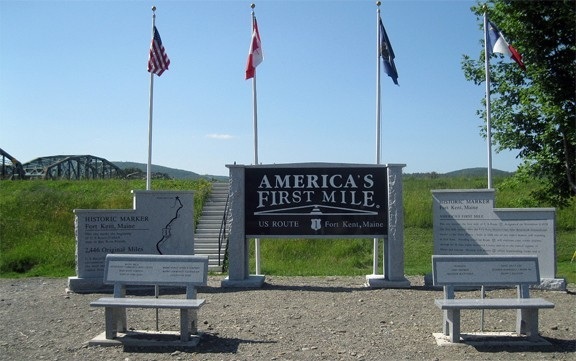 Claim to fame: at 2370 miles, US 1 is the longest north-south US route. That has been true even since the early days, when the highway ran only as far south as Miami, ending at the same place where US 94 began (view photos from there on the Miami page). 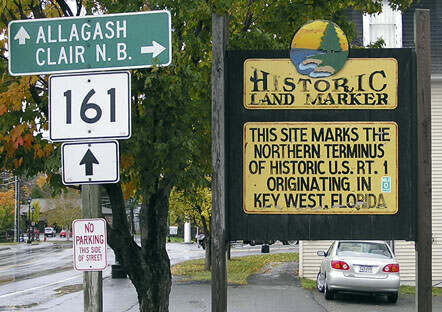 ​By 1938 the south end of US 1 was extended to its current terminus (view photos from there on the Key West page). ​If you are curious about the text on those side panels, Greg Corkum sent detailed photos, which you can view here (and on adjacent shots in the photostream). It is a cool monument, with steps leading up to a nice view of the bridge at far left. Not many places celebrate a highway terminus to this extent. But technically US 1 does not have a beginning or an end; it simply has a north and a south terminus. 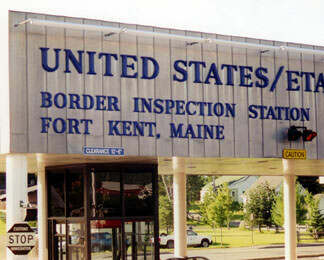 In fact, Ft. Kent is not even the northernmost point in Maine. 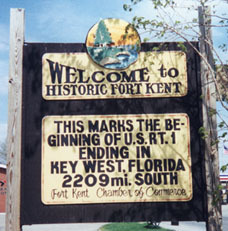 For that reason, one could argue that US 1 should not be signed all the way to Ft. Kent. It might make more sense to end the designation at the Madawaska border crossing, which connects with the city of Edmundston NB and a more heavily-used Canadian highway. 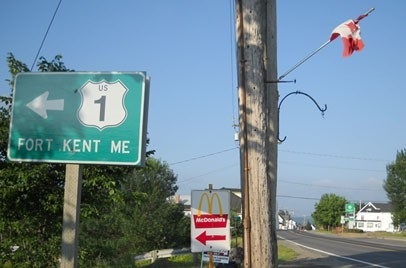 From Madawaska, US 1 actually goes south and west to reach Ft. Kent. 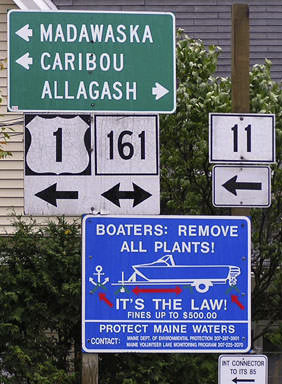 So rather than signing that segment as "NORTH US 1", it would probably make more sense to designate it as "SOUTH ME 11". That sign actually means "TO hwy. 11". About a block in that direction is the wooden signboard mentioned above. In addition to that, if one goes to the right for about a block, there is another wooden sign at the municipal center (photo). ...although, as mentioned previously, that bend to the left swings drivers almost due north. 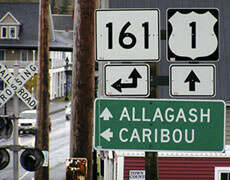 That assembly is at the junction with ME 11, the north beginning of which is currently to the right. One could make a case that the ME 11 designation should be extended ahead, replacing US 1 until it reaches the bridge at Madawaska. 1185 miles to the south is the midpoint of US 1, in Colonial Heights VA. Another 1185 miles south of there puts travelers at the south end of US 1, in Key West. last updated Oct. 12, 2016.